Police arrested a man wearing chain mail body armour as they seized a haul of weapons and drugs during a disturbance in Lancashire. Concerned residents had reported a large gathering of people in Westfield Road, Nelson, on Tuesday evening. Officers attended and found weapons including meat cleavers and axes hidden in cars, before a search of a nearby home revealed a cannabis farm. Five people were arrested on suspicion of violence and drug-related offences. 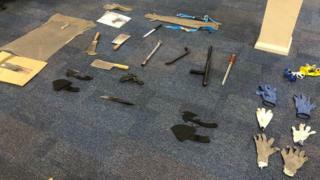 Three men, aged 28, 31 and 32, were held on suspicion of conspiracy to commit violent disorder and possession of offensive weapons. A further two arrests were made at a house in Smith Street, where the cannabis farm was found. A 44-year-old man was arrested on suspicion of conspiracy to commit violent disorder and possession of offensive weapons, and a woman, 36, was held on suspicion of cultivating cannabis and extracting electricity. A spokesman for Lancashire Police said the arrests were believed to have prevented violent disorder taking place.